WrestleMania 35: Roman Reigns Vs. Drew McIntyre - Wrestling Inc.
We go to the ring and out comes Drew McIntyre with a group of bagpipers. Roman Reigns is out next to a big pop. We get fireworks over the stadium and at another location next to the stadium. Reigns hits the ring and Drew stares him down. The bell rings and they stare each other down for a second before the brawl breaks out. They go at it and Reigns hits an early Samoan Drop. Reigns mounts Drew in the corner with right hands. Reigns with more offense and a big boot. Drew comes right back with a big Spinebuster for a close 2 count. More back and forth now. Reigns catches Drew with a big boot on the apron. Drew bends over and Reigns drops a leg over his back, sending him to the floor. Reigns brings it back into the ring to break the count. Drew immediately drops him with a Glasgow Kiss headbutt. Drew briefly stands over Reigns and poses before going back to work on him. Drew launches Reigns overhead and sends him flying. Drew keeps Reigns grounded by the arm now, talking trash. They fight up and out from the mat. Drew rocks Reigns with knees to the gut. Reigns sends Drew to the apron and ends up clotheslining him to the floor. Reigns runs around the ring and goes for the Drive By but Drew misses and Reigns lands on the apron. Drew pounds on Reigns now. Standing on the floor now, Drew suplexes Reigns from the apron to the floor and Reigns lands hard. Drew ends up delivering a big Alabama Slam in the middle of the ring. Reigns barely kicks out in time. Drew mounts Reigns on the mat and pounds on him. Drew takes Reigns to the top and climbs up with him, talking trash. Reigns rocks Drew with a right, then a headbutt to turn Drew upside down in the corner. Reigns stands up but Drew powers up, launching Reigns to the mat with a throw. Drew brags to Reigns about ending The Shield. 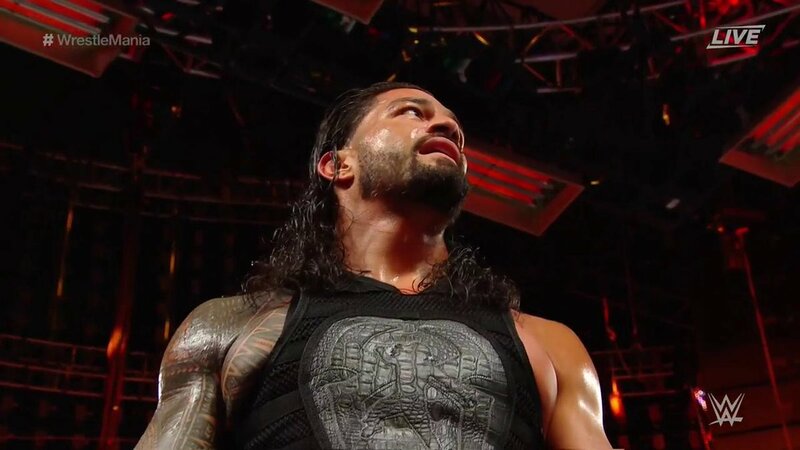 Reigns fights back but Drew slaps him in the face to disrespect him. Reigns fires back with a huge clothesline and a big boot, sending Drew to the floor. Reigns runs around and hits the Drive By this time. McIntyre retreats and tries to pull Reigns to the floor. They both end up on the floor as the referee counts. They bring it back in the ring and Reigns sends Drew down. Reigns calls for the Superman Punch but Drew dodges it and hits a headbutt. Reigns nails the Superman Punch. Reigns waits for Drew to get up and then delivers the Spear for the pin to win.